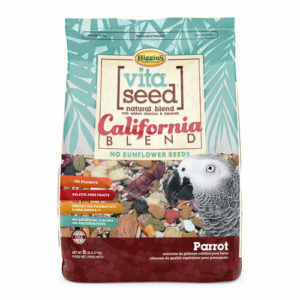 Sunburst® Gourmet Blends are our premium, fortified, natural bird foods formulated as a food and treat all in one. 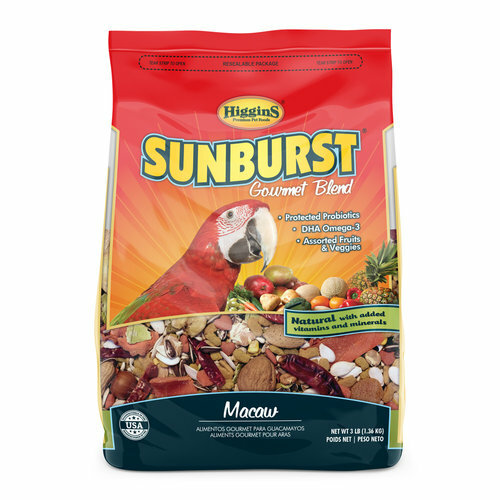 Sunburst® for Macaws has larger and chunkier mixed exotic fruits and vegetables, wholesome seeds, grains, nuts, legumes and much more! 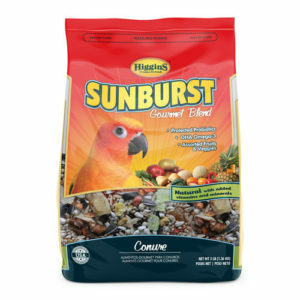 What you won’t find in Sunburst® are artificial colors, flavorings and preservatives. 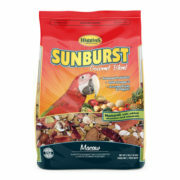 Sunburst® is enriched with plant-based DHA Omega-3 fatty acids as well as protected probiotics to support immunity. 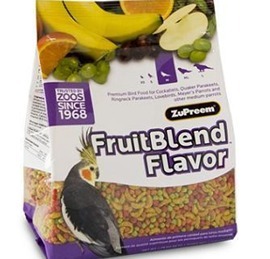 Safflower, Corn, Sunflower Seeds, Ground Corn, Buckwheat, Yellow Peas, Wheat, Flaked Peas, Apricots, Flaked Beans, Almonds, Hazelnuts, Peanuts, Pumpkin Seeds, Bananas, Mango, Papaya, Pineapple, Raisins, Dates, Brazil Nuts, Carrots, Pecans, Pistachios, Walnuts, Dehydrated Apples, Red Peppers, Brown Rice, Dried Egg Product, Soybean Meal, Oat Meal, Sugar, Canola Oil (preserved with mixed tocopherols), Dicalcium Phosphate, Calcium Carbonate, Salt, Cranberries, Apples, Blueberries, Celery, Beets, Parsley, Lettuce, Watercress, Spinach, Brewer’s Dried Yeast, DL-Methionine, L-Lysine, Choline Chloride, Algae Meal, Mixed Tocopherols (preservative), Potassium Chloride, Rosemary Extract, Yeast Extract, L-Carnitine, Vitamin A Supplement, Vitamin D3 Supplement, Vitamin E Supplement, L-Ascorbyl-2-Polyphosphate (Source of Vitamin C), Zinc Sulfate, Ferrous Sulfate, Niacin, Folic Acid, Biotin, Manganese Sulfate, Copper Sulfate, Calcium Pantothenate, Thiamine Mononitrate, Pyridoxine Hydrochloride, Riboflavin Supplement, Zinc Proteinate, Manganese Proteinate, Copper Proteinate, Menadione Sodium Bisulfite Complex (Source of Vitamin K), Calcium Iodate, Sodium Selenite, Cobalt Carbonate, Vitamin B12 Supplement, Turmeric, Color Added (Annatto), Natural Flavors, Dried Enterococcus Faecium Fermentation Product, Dried Lactobacillus Acidophilus Fermentation Product, Dried Lactobacillus Casei Fermentation Product.